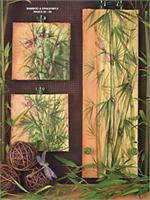 ACRYLIC BOOK. Another Beautiful book from Ros, brimming with new project to inspire you to pick up your brush and paint. 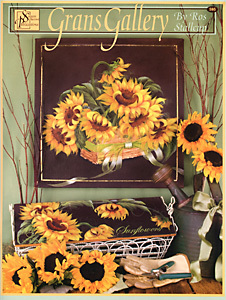 Sunflowers, a favorite flower, golden and bright grace a contemporary canvas, basket and brighten a farmers market sign. 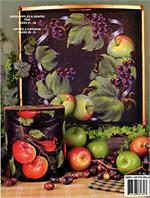 Green apples and luscious grapes drape across a tray, lazy susan, cook book stand and glass jar. Bamboo and a dragonfly dance across 3 different canvas. 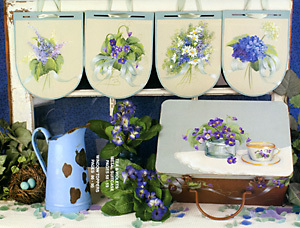 Chelsea Garden is a garden scene and birdhouse that surround a mirror in delicate green violets and a sprinkling of flowers. Soft pale roses and ribbon are painted on Angel Tree topper, basket and Triptych. 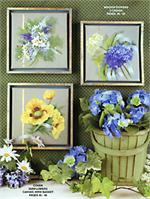 Window Toppers are painted each with a different flower design, violets, lilac, daisies and hydrangea. 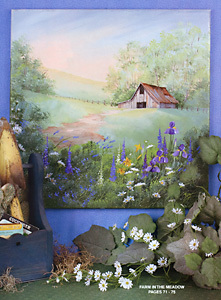 Farm in the Meadow is beautifully painted on a canvas with a wild garden of flowers to make the scene complete. Fall Window looks out onto a tree scene a blaze with the colors of fall. Delicious fruit embellish a door crown in yummy colors. 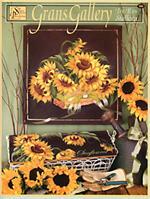 Plant Sale sign is designed with clay pots brimming with red geraniums, impatiens, daisies al on a slate colored background. 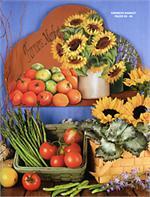 Pottery Pitcher still life is a quiet classic painting that has a timeless beauty, great to hang in a kitchen. There are so many lovely projects that you will want to paint them all.